.SERPENT Media Archive - Regadrella sp. 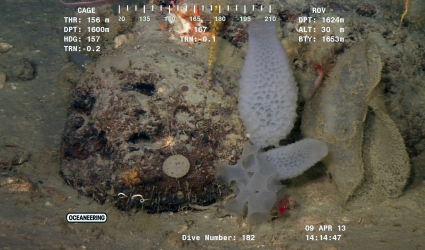 Porifera (Phylum)> Hexactinellida (Class)> Hexasterophora (Subclass) > Lyssacinosida (Order)> Euplectellidae (Family) The vase-shaped glass sponge was seen attached to rocks at Mzia-2 (1600 m). The specimens may represent one of several genera within the sub-family Corbitellinae but it is most likely Regadrella sp.